When I had dinner with 娜姐 last week, she mentioned that Neal Martin was coming back to town... and would I be interested in joining them for a casual dinner? As Neal is an easygoing guy and it's been a while since I last saw him, I figured there was no reason not to join them for dinner. I had suggested a Cantonese restaurant that none of us had been to, as I kinda wanted to check the place out. But our hostess was a little concerned about whether the wine service was up to her standards, so we ended up at Holytan (葆里湛) - which was literally across the street from my office building. I vaguely remember seeing glimpses about this place on social media, so I found a review on Fungry and Fabulous and became a little worried. Would I have the same kind of experience as a wine dinner a few months ago, where I could only smell the grilled beef and not the wonderful wines I was drinking? That would be a real shame, since we were sure to bring out some nice bottles tonight. Fortunately our hosts have been there on several occasions, and didn't find ventilation to be an issue. I arrived and was relieved to find that the aircon was on full blast, so I wasn't able to smell the kitchen. After everyone arrived and the wines had been taken care of, it was time to eat! The amuse bouche was a little skinned cherry tomato with beef gelatin, sprinkled with what I thought was black olive powder. Wildcat Cove oysters with tomato jelly and caviar - these oysters from Washington State were pretty creamy with a little brine. Interesting to have the tomato jelly on top, and after reading Lynn's review I found myself being very gentle with the oysters... less I splashed jelly all over myself. Slow-cooked blue lobster with sake sorbet - we were asked to taste the sorbet first. I couldn't get much sake flavor but did taste lots of tomato, so I checked with our server and only then was told that it's actually sake and tomato. The homard bleu was very, very tender, and the fennel was kinda interesting, but I wasn't a fan of the creamy-lemony sauce. Vegetable soup - Brussels sprout, tomato, radish, potato... and curiously flavored with rosemary. Pretty nice, though. In the end I think it goes like this... (keeping in mind that this was told to me when I was a little buzzed, so it may not be totally accurate) The beef is grilled in a small grill over Binchotan (備長炭) for the smoky flavors, then it goes into the "far infrared oven" - which apparently has two parts - at 88°C for one minute. Then it gets moved to the other part of the oven at around 50~60°C for anywhere between 45 minutes to an hour. Then I think it goes back to the grill for a second finish over Binchotan... but I'm not entirely sure about this last part. ...which was very well-marbled. Very succulent and melt-in-your-mouth. Lovely smoky flavors from the Binchotan, but not too heavy. Very delish. Perfect on its own. Now about the wines... We discussed the theme a few days beforehand, and finally settled on having everyone bring something from 1998. 1981 Krug - sweet and caramelized nose, with a little straw, Chinese licorice (甘草), minerals and marmalade. Acidity was pretty high, and there were almost no bubbles left. Very lovely. 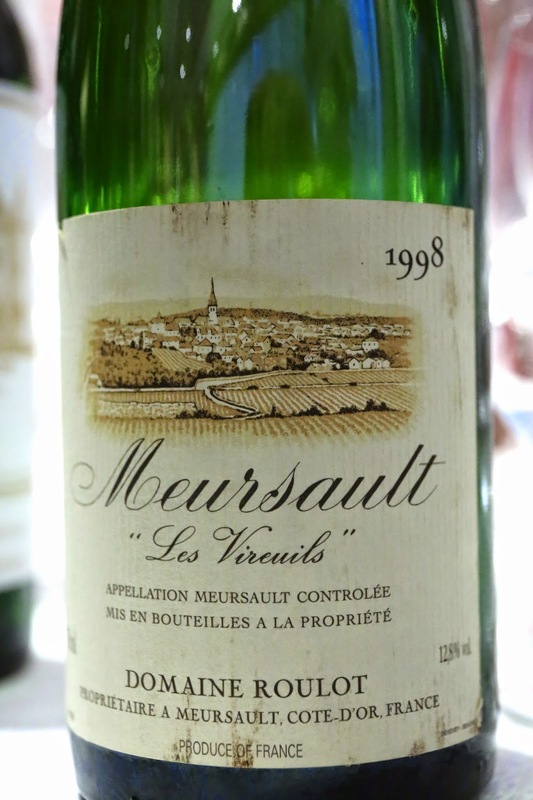 1998 Roulot Meursault Les Vireuils - initially when the bottle was opened, we detected oxidation but wasn't sure if it was premox. Turned out it wasn't, but it was still a tiny bit off. Surprisingly dry on the palate, a little dusty, a little flinty, with marmalade. 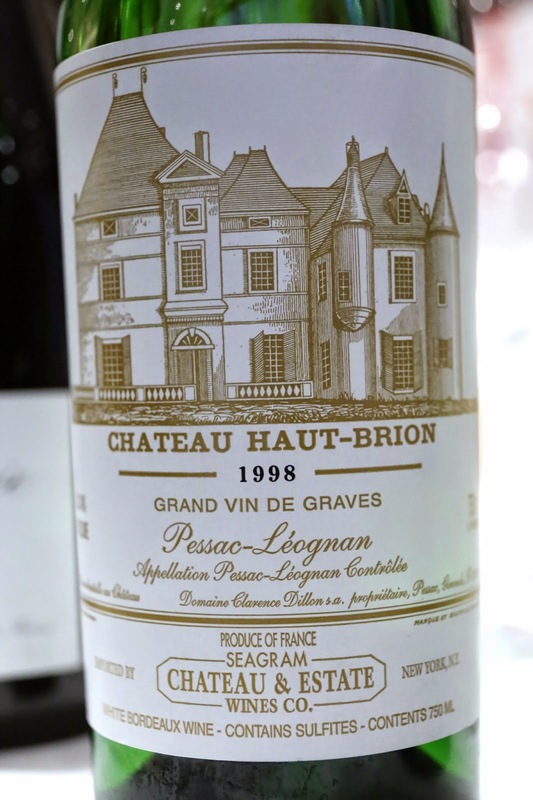 1998 Haut-Brion Blanc - HUGE nose, slightly pungent, mineral, flinty and lean. The Sauvignon Blanc was definitely front-and-center, with a little bit of plastic. Later on it opened up and became a little buttery and fatty, showing its ripeness. Absolutely awesome, and by far the wine of the evening for everyone. 1998 Prieuré Roch Vosne-Romanée Clos Goillotte en magnum - very cloudy as expected, very toasty corn, plenty of sweet fruit, not clean but a little dirty, slight hint of forest with animal and leather coming out later. 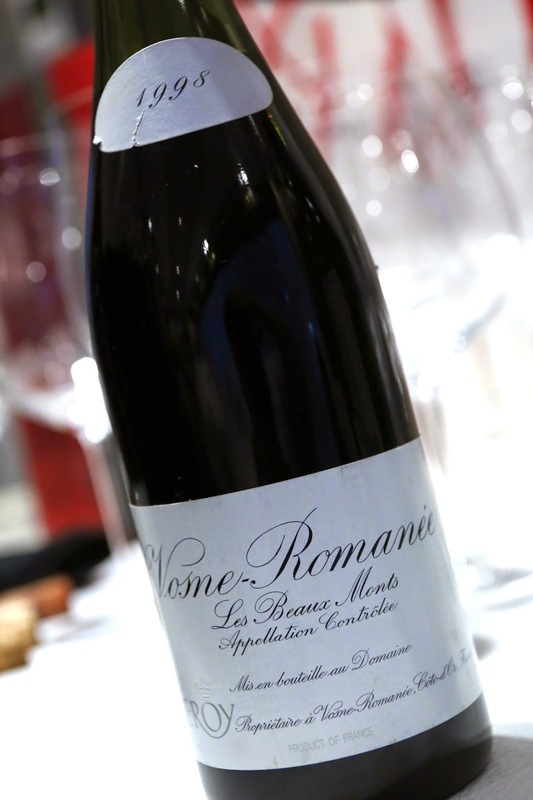 1998 Leroy Vosne-Romanée 1er Cru Les Beaux Monts - nose of toasty corn, also a little dirty, with plenty of nice fruit. 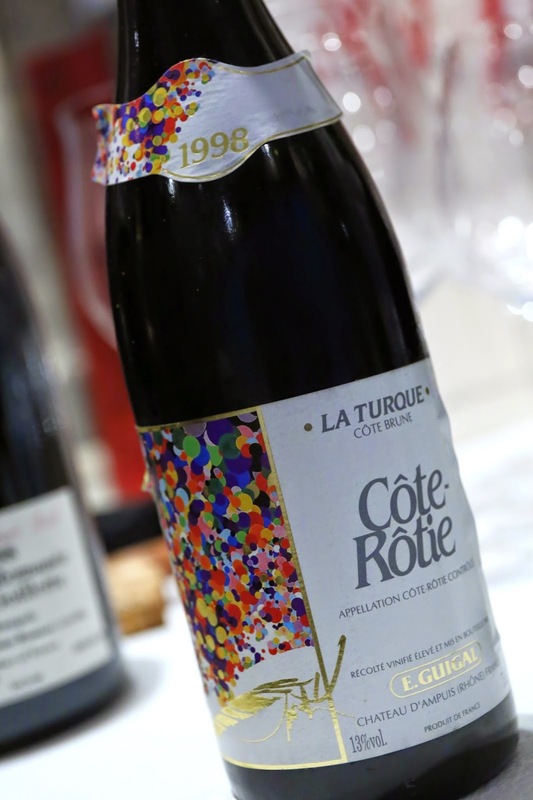 1998 Guigal La Turque - despite being decanted for close to 3 hours, the wine was still pretty closed and tight. Nose of forest pine, smoky and woody, very clean and cool. Very fragrant later, and after almost 4 hours we finally found some bacon fat. This bottle was waaay too young. 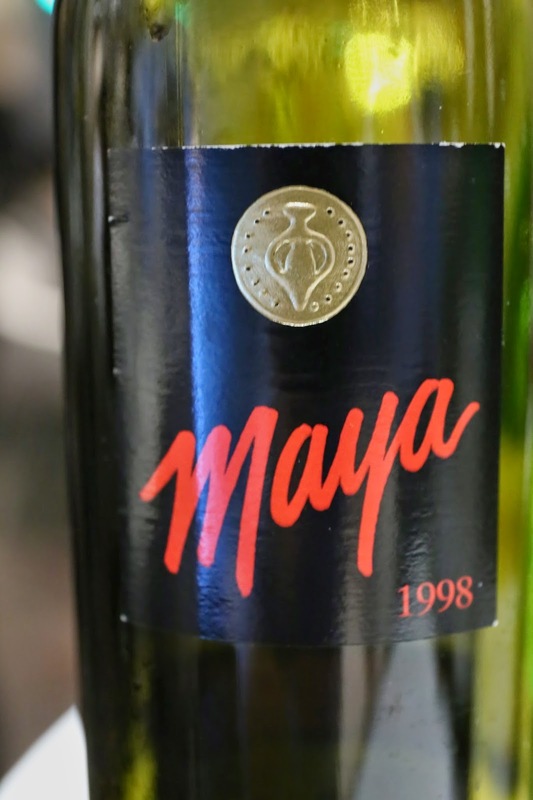 1998 Dalla Valle Maya - ripe and smoky nose, still pretty tannic on the palate. A different animal. 45% Cab Franc and 55% Cab Sauvignon. 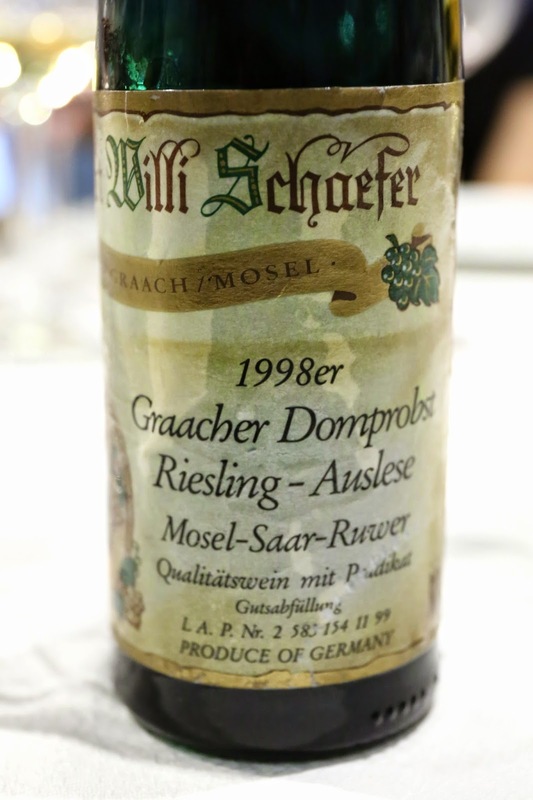 1998 Willi Schaefer Graacher Domprobst Riesling Auslese from half bottle - petrol, flinty, apricot, marmalade. Nice acidity.